Translating Disney’s animated classic Dumbo into a live-action film presents a number of issues, from the debate of whether or not to make the animal characters talk to how to inflate what was essentially a one-hour animated movie. It’s certainly a challenge, and director Tim Burton steps up to the plate to give it a shot. Choosing Burton might seem baffling, but it’s a rather sound choice considering he specializes in films about outsiders and creating weirdly compelling visuals. And while Burton gives this film the old college try, he can’t quite steer the flying elephant story out of being a lesser rendition of Disney’s classic animated film. Distancing itself from the likes of The Jungle Book and the upcoming live-action The Lion King, Dumbo does not talk and neither do the other animals. And so human characters enter the story to provide dialogue, analogy alignments, and longer running time. The circus is run by the cantankerous old circus owner and ringmaster Max Medici, played with a bold exuberance by Danny DeVito, who still hasn’t lost that charming edge. Medici is a swindler of sorts, but has enough of a heart to support two kids, Milly and Joe, while their father Holt (Collin Farrell) was off at war. Even when Holt returns with a missing arm, he’s still welcomed back into the circus. Though Medici is a greedy man, he has decided to make an investment in a pregnant elephant, who soon gives birth to the big-eared Dumbo. Doe-eyed and curious, the baby elephant is initially looked down upon, until the children make a miraculous discovery: that Dumbo’s unfortunate ears have granted him the gift of flight. 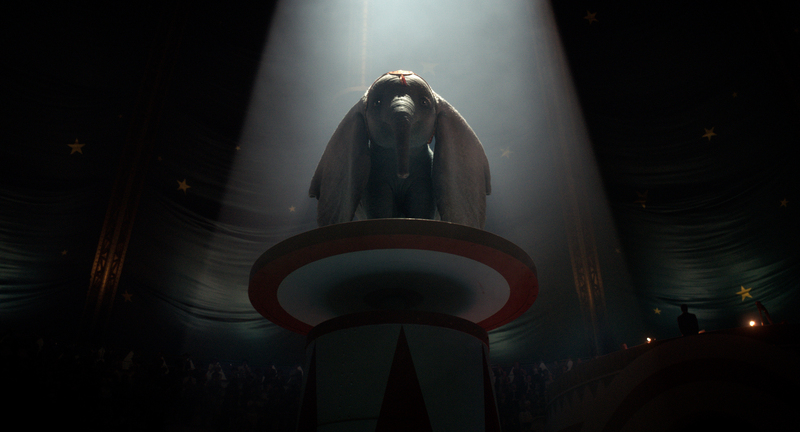 They are amazed at this discovery, and by the time Dumbo has a chance to showcase his ability under the big top, it’s a wondrous sight—complete with a hauntingly beautiful Danny Elfman score. But even when distancing itself from the original, there were still plenty of distractions that took me out of the film. The central villain is a rich amusement park owner, played by Michael Keaton, who gets too nutty with the role; it’s hard to tell if he’s trying to pull off an accent or not with his wildly weird character. Perhaps he’s trying to out-crazy the likes of Alan Arkin, who also plays a deranged corporate figure seeking to invest in Dumbo. But what is easily the most distracting element is the presence of wrestling announcer Michael Buffer as a ringmaster who delivers an expected gag of a line to introducing the flying elephant, as though he were going to lay the smackdown on some circus clowns. One area where Disney does seem to be improving is in its use of more inspirational young girl characters. They had previously stumbled with representation in A Wrinkle in Time and The Nutcracker and the Four Realms, and this film was looking to head down the same route; Nico Parker in the role of Milly provides a lot of exposition about science as a career path. Thankfully, her character’s ambitions play a slightly bigger role than the predictable faith in one’s self, and the portrayal of STEM for girls comes off more engaging this time than in the past. The main problem with Tim Burton’s Dumbo is that it feels more reflective of the Burton aesthetic than the heart of the original. Sure, Dumbo is cute, even though his clown makeup makes it difficult to shake those Heath Ledger vibes, but he seems more likable as a concept than a character—his personality is hidden behind eyes almost as big as his ears. He seems to mostly disappear before turning into a hero in the explosive third act, which embodies the Burton style with deep colors, dark shadows, and trademark spookiness. 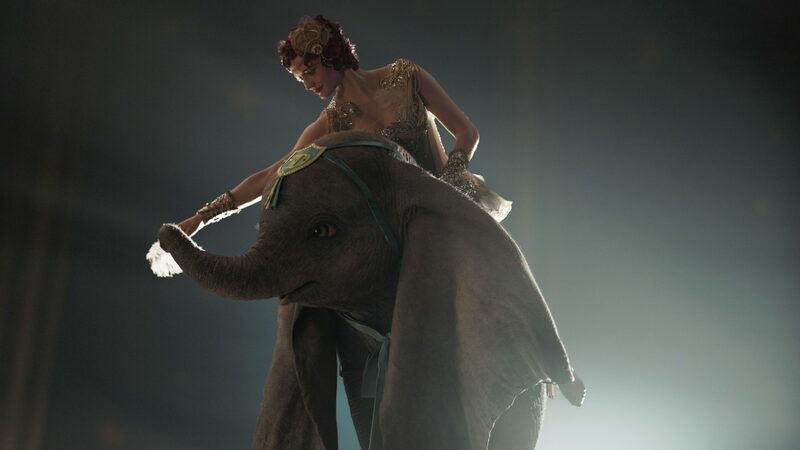 While Dumbo does have a bit of the right stuff Disney should be using to make their live-action adaptations more distinct, they still need to shake those fears of conforming to the expected and find a firmer tone from their directors. Movies of Mention! King Arthur, Diary of a Wimpy Kid, and More!